Last week, I had to put down one of my pets, George (Georgie to me, Jorge to my wife or Georgito to Carlos). At left is a photo of Georgie taken last year and before the health issues. That cat surely loved to sit outside on the terrace and enjoy the morning Costa Rica sun. Eyes closed and as close to being in heaven as he could get yet still be alive. He was quite old…. 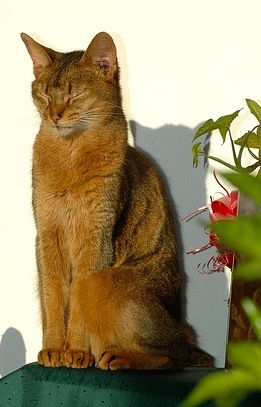 fourteen plus… and had terrible and incurable kidney problems, common for old cats. In addition, he was nearly blind. Â I feel terribly guilty as I probably waited too long and caused him too much suffering. Â It was just too hard to let go. If you wish… read on! 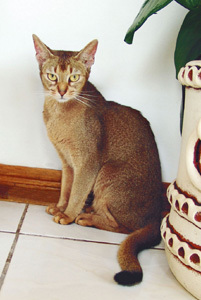 Georgie was a many time grand champion Abyssinian and the only animal who did not join the family as a kitten. Â He was an old and experienced 2+ year old cat when my friend and Abby breeder Robin Sessler suggested that he needed a home other than her cattery. Â I accepted, and Georgie came to live with me in about 1998. Shortly thereafter, one of his many offspring, great granddaughter Charlie, joined the clan, and off we went to live in Costa Rica. A true adventure for man and cats. Georgie loved it here… no more cold Chicago winters… easy to find a sunspot nearly any day of the year, and someone always in the house to pay him some attention. Â He could always find a welcome spot on anyone’s lap. Helluva life I suppose and that memory makes me very happy. Any of you who have pets know that they are so much more than just animals or birds or whatever. Â They are the essence of family. Their loss is as painful to us as the loss of a dear friend and can be equal too or greater than the loss of some family members. I think I know why. I have given this some thought and I have concluded that this is because our pets, unlike our friends or even family, are simply incapable of hurting us, intentionally or otherwise. They demand little. Â They are, under normal circumstances, love machines, wanting so very little and giving so very much. No contracts, no expectations. Â Georgie was a most special cat. Â He loved and trusted everyone. Â Those who slept in this house could be awakened (annoyingly, I grant you) by Georgie’s cold nose literally head butting them out of their sleep… motor running at full volume. I do not know how I will survive without that cat…. Georgie and Charlie are famous in Costa Rica, at least amongst cat lovers! After a few years of living here, I had the honor of taking George and Charlie to be exhibited at a pet show in Coronado. Â There I had the pleasure of meeting Adelita DurÃ¡n, president ofÂ la AsociaciÃ³n Ga-Ticos.Â This wonderful lady puts on cat shows almost every year (TICA sponsored). She apparently then contacted Christine Bork, publisher of the pet magazine. Pets & Mas, (pets and more) who soon came to my home with a photo crew to do an article on Abyssinians in general and George and Charlie (pictured left) in particular! Not too many pet owners have the opportunity to have their special family entered into posterity in the best pet magazine in Central America! If any of you are inclined to read that issue, it is number 47 (Vol 1, Year 5, 2004) and can be ordered here. I wish that I could say that I feel better after writing this. Â I thought I would. Â I simply do not. Â I miss Georgie every minute of every day. Â I believe that animals, like children, go directly to heaven, (no matter how you define “heaven”). Â I believe it to beÂ automatic and instant. Logically, I know I will survive this… Â I know that this too shall pass… But I hurt so damned much. Rest in peace my Georgie. Subscribe to comments with RSS or TrackBack to ' To Georgie – Rest in Peace Old Friend- You will be missed. '. George was the reason to meet you, just for that I will never forget him. I cried reading your words, I know how it is to loose a pet, I just did last year with my beloved Natz, I still miss him and now as I founded a Foundation to his name, FundaciÃ³n Natz de la India,I see the logo and just want to cry. My condolences on your the loss of your beloved Georgie. I had to euthanize my cherished cat Mitts on 5/26/10 due to renal failure also. He was 17. I’m actually crying as I type this. You will get over it. Hard to believe – but true. This was the biggest loss of my life. It will get better in about a week or two. Then every now and then you will be overcome with sadness and grief – like I am right now. It is a devastating loss. Their souls are someplace else now and unfortunately not with us any longer. I always tried to connect with Mitts right after he was gone heart to heart. From my heart to his heart. He could tell how I felt about him while he was here. And he knows how much I miss him where he’s at now… from my heart to his heart. Direct connection – no time and space. I still love and miss him so much. I wish you the best in healing from this profound loss. The best thing about pets is they give you unconditional love. It makes no difference to them if you are a prince or a bum….But it is far better to have loved and lost than never loved at all. They add so much joy to our lives and it is a sad time at their passing but I thank God that you got to enjoy them for the time you did. May the memories last forever and the joy of those memories quickly overshadow the pain of your loss. I am so sorry to hear about your loss of your beloved cat, George. You are right, our pets become family members and in losing them, is like losing any dear family member. I lost my two Boston Terriers (a mother and daughter) within 5 months of each other. They were 16 and 13 years old. I think the daughter died of grieving for her mother. I was devastated and it bring me to tears just the think about them today. A friend sent me the poem below, and though it was written for a beloved dog, it applies to any beloved pet. I hope it will bring you some comfort. Do not break my spirit with a stick, for although I should lick your hand between blows, your patience and understanding will quickly teach me the things you would have me learn. Please take me inside when it is cold and wet, for I am a domesticated animal, no longer accustomed to bitter elements. I ask no greater glory than the privilege of sitting at your feet beside the hearth. Keep my pan filled with fresh water, for I cannot tell you when I suffer thirst. And, my friend, when I am very old, and I no longer enjoy good health, hearing and sight, do not make heroic efforts to keep me going. I am not having any fun. Please see that my trusting life is taken gently. I shall leave this earth knowing with the last breath I draw that my fate was always safest in your hands. I just fond your site yesterday and took a look at your blog this morning. I have a cat and also a dog (we adopted him in Costa Rica 2 years ago), and I feel your loss for we had to go through the process afew years ago. So sorry to read about your cat. I lost mine about 18 months ago and will treasure my memories of him forever. And thanks for writing such a thoughtful site on Costa Rica. My wife and I are considering a move somewhere in the Caribbean with our daughters and I was researching your site. Well done. this is the the first time I have visited your blog–not fair to make a person cry the first time they go to a blog!! I have 3 cats, 2 of them are about 11, and 1 (my boy) has diabetes!! I have had other cats and dogs. My Ivey cat lived to 21!! They are my family, and have meant more to me then I can even express. I dearly want to come to Costa Rica and bring my “family” with me. Working on it, as much as I can–maybe someday soon.I know there is a reason I found my way here. I am sorry for your loss of Georgie, and wish you and your family good things. Your cat sure was pretty, Ken. Rich & I droved from Chicago to Las Vegas with our possessions on March 1, 2012. As we lost our home and Rich his job. Rich was “lucky” to find a job with the help of his brother in-law, Ken. We could not take our boys with us. Needless to say, I was very upset to say the least. And, oftened E-Mailed Safe Harbor Human Society to check on Lenny & Bandit. Bandit (Buggie boy) was the first to find a home as he had a lot of Siamese in him. Then, finally Lennard. I was sooooo happy to learn they each got a new family. I keep their photo near our desk to remind myself just how “luckey” I was to have them. Take heart Ken….there a lot of us out here with animals (no matter what kind) share in the love & the loss of yours, too.